As a member of a Science Lifestyle family, you are probably on the lookout for science related activities that the entire family can enjoy. 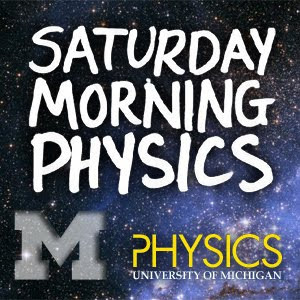 Since Saturday mornings usually find the family together, what better way to enjoy some quality time than to attend an event like Saturday Morning Physics sponsored by the University of Michigan. In 1995, the Department of Physics at the University of Michigan launched an exciting new lecture series to share some of the latest ideas in the field with the public. The lectures are free and open to the public. Designed for general audiences, the lectures provide an educational opportunity to hear physicists discuss their work in easy-to-understand, non-technical terms. The lectures are complete with multimedia presentations including hands-on demonstrations of the principles discussed, along with slides, video, and computer simulations. Then after the lecture, the whole family can sit down to a nice lunch and discuss all the concepts covered in the morning session. It makes for an excellent educational experience. If you don’t happen to live in Ann Arbor, Michigan, attending the lectures in person may present a problem. But not to worry, you can view all the lectures past and present from the department’s website (by clicking on the Taping link). You could set-up a large monitor in your living room and enjoy leading-edge physics in the comfort of your own home along with the kids and neighbors. Caltech also has its Science Saturdays lecture series, so your own local university may have a similar Saturday program. It is worth while checking out as a great way to spend the weekend. thanks for all the science tips Daniel. i think its a great way to spend the weekend with my sons.